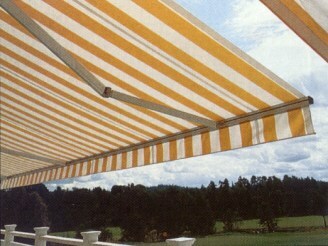 Perma Ibiza Retractable Awning Custom Canvas Co.
Sun Protection That's Beautiful From Any Angle! Ibiza Retractable Arm Awnings will enhance your outdoor living. 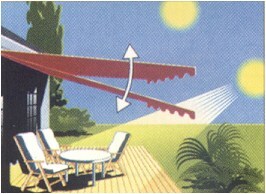 Ibiza retractable arm awning lets the sunshine in when wanted and quickly provides cool comfortable shade when needed. The Ibiza Awning opens and closes by either a hand crank or by an optional electric motor. Ideal for decks and patios, the Ibiza awning can be mounted on a wall, soffit or roof. When not in use, or during bad weather, the Ibiza awning is self storing. Every Ibiza Awning includes European influenced technology, designed to provide unsurpassed performance, durability and reliability for many years of enjoyment. Choose from a wide selection of beautiful weatherproof fabrics including contemporary colors, prints and striking patterns that best coordinate with exterior architecture. 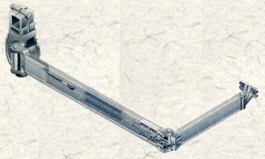 Retractable awning arm with adjustable angle control. Several awnings can be connected series. Arms include stainless steel chain hinge for maximum durability. Operated by a manual gear and hand crank. All brackets are made of heavy, extruded aluminum. Screws, shafts and cables are produced from non-corrosive materials. Front profiles and arm profiles are made of extruded anodized aluminum. Available in white, bronze or almond anodized aluminum frame. All Somfy products shown are weatherproof, and UL approved. Everything you want in a retractable awning becomes easier to use and more enjoyable. 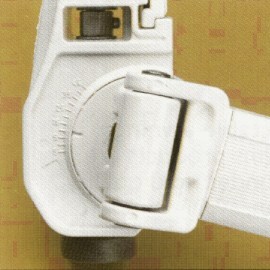 Retractable Arm with angle control. 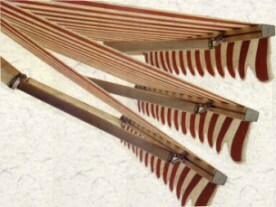 Arm springs provide even tension for the fabric and act as a shock absorbers when windy. Exclusive pitch control allows for easy and precise adjustment of the awning from -5 to 45 degrees. Follow The Sun In Shaded Comfort! As the path of the sun changes with the seasons, an exclusive and standard feature of the Ibiza Awning. The Ibiza exclusive pitch control allows for minor pitch adjustments in the angle of the awning, so the use of a patio or deck is extended.